Uuras the Shepherd is a Bosmer scout, who resides in Skingrad and makes a living herding sheep and producing sheep's cheese. He is also a basic trainer in Athletics. Uuaras gets out of bed every morning at 8am and immediately heads out into the open fields to herd his flock of sheep around, generally in the grassy area west of the Surilie Vineyard. At 6pm, he calls it a day and locks up the sheep for the night, before going home to his Skingrad residence, where he will spend the evening wandering around until bedtime at midnight. Unlike most other Skingrad citizens working out in the open, Uuras will stay with his sheep even in heavy rain. And unlike most trainers, he will train you at all times, including when he's asleep in his house. He carries the key to his house as well as a few gold coins; his wardrobe consists of a coarse linen shirt, a pair of huntsman pants and sandals. When approached for the first time, Uuras will reveal that he is quite passionate about his sheep and the cheese they produce: "It is all in the nose. Yes, of course, it is also in the mouth! The fragrance, the sharp, startling odor... the sheep's cheese... ambrosia! Nectar! Yes. I am the Shepherd, Uuras. And it is my sheep, and my deft hand and sharp nose, which produce the glorious cheeses of Skingrad." When asked about Skingrad, Uuras will tell you: "Where can you get sheep's cheese but in Skingrad? And why? Because only in Skingrad is Uuras, Master of Sheep's Cheese! I can also teach a bit of Athletics. Why, you ask? Because I am the mountain sheep's brother, and I must dash with him from crag to crag." When asked about rumors, some Skingrad citizens will comment on Uuras and his enormous passion in life: "Uuras the Shepherd sure takes care of his sheep. And, boy, does he like cheese! I mean, he really likes cheese. ", "No doubt about it, the man loves cheese. And sheep. Just cheese and sheep. ", "Uuras is a good shepherd, but his real love is cheese. Of course, there's no money in herding cheese." and "I like cheese. Not more than sheep, though. I'm not sure about Uuras." 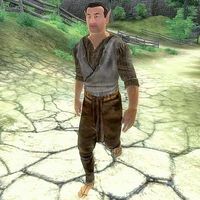 The only citizens aware of his Athletics skills are members of the Fighters Guild, as they will occasionally remark: "We have trainers for block and marksman in Skingrad. And there's a shepherd who teaches athletics, too, I think." You can sleep in his bed with no owned bed/trespassing message. Esta página foi modificada pela última vez à(s) 19h26min de 14 de maio de 2015.